"M" Series Chain Pulley Blocks With a hardened special alloy steel load chain. Rust proof metal is used for the obtainment of these Chain Pulley Blocks. These products are hard framed and accurate in dimension and perfect in finishing. These presented products are easy to use due to light weight and do not get damaged by using up to several years. 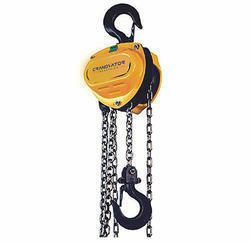 We Have manual hand chain blocks are durable, but still lightweight enough to be transported easily. 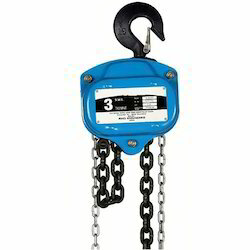 We offer both KM2 hand chain blocks with a lifting capacity of up to 5, 000 kg and KMP hand chain blocks that lift up to 20, 000 kg. We offer a comprehensive range of Chain Pulley Block & Traveling Trolley that consists of a wheel along with a groove. The direction of force applied to the rope wire can be changed by running a rope on the equipment. These are appreciated for their compact sizes, lightweight, minimum maintenance and easy handling.